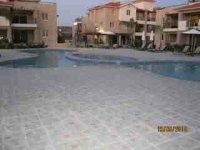 VILLAS AND APARTMENTS TO RENT IN LARNACA, CYPRUS. Welcome to our selection of holiday homes to rent in Larnaca, Cyprus. Did you know that according to the legend Aphrodite supposedly sprang up from the foam in ancient Cyprus? In fact, there is a place called Aphrodite�s Baths near the town of Polis in Cyprus. This is just one off the things a visitor can see in this beautiful country, particularly in Larnaca. There is something that evokes a sense of history as far as Greek churches are concerned. The Agios Lazaros Church is no different. It is the best example of Byzantine architecture and was built over Lazarus tomb. From here, head to the HalaTekke Mosque, where the prophet�s aunt is buried and is another architectural delight. Next to it is the Salt Lake of Larnaca. You can actually walk over it during the summer months. In winter, migrating flamingos can be seen making a stopover here. Move on to the Old Fort which was built to protect the city from Turkish invaders. It eventually became a prison and today it is a well-stocked museum. In summer, it turns into a venue for concerts. After this, head to the Pierides Museum to take in 3,200 years of Greek-Cypriot culture. Most of the exhibits have not been displayed often and provides you an opportunity to admire these treasures at close quarters. The Larnaca Aquaduct is also a must see. It was built to carry fresh water for the poor in the city through a long underground tunnel. Those of you interested in art must head to the Cyprus College of Art, which has displays works by students as well as tutors. Cape Greco offers a lot by way of natural beauty. It also has a protected nature park. From the high points on the cliff, you can see some spectacular sights of the sea. Be warned though - legend has it that it is the home of the Ayia Napa sea monster! Move on to the Palmtree Promenade where you find restaurants, shops, sandy beaches and discoes. You can also head to the promenade in Larnaca which has many souvenir stalls. While at the seashore, you must catch the sunset from the beach. It looks truly romantic! Round off the visit with a trip to the Market, where you can pick up some souvenirs. Or capture some interesting facets of the place on camera. Being on the Mediterranean, Larnaca is warm and pleasant throughout the year. Summers tend to be sultry, but have a lot of cultural events in the evenings. It is well connected by flight and is a mere 15 minutes from the airport to the city. Looking for self catering holiday accommodation in Larnaca? 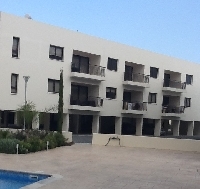 Then below is a selection of apartments in Larnaca and villas in Larnaca that can be rented direct from their owners. You can either click on each listing for further details or you can use our search engine on the left if you are looking for something in particular.